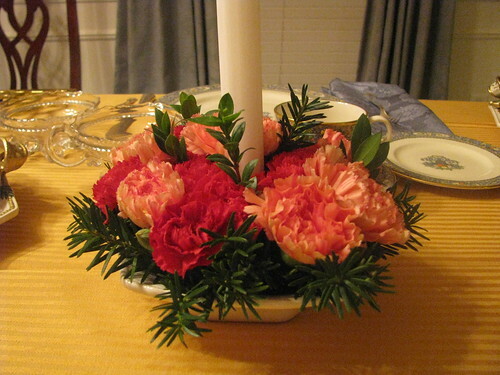 Want a pretty (and easy and inexpensive) centerpiece for your Thanksgiving table? I bought the small white dishes at TJ Maxx for a couple dollars each. To make the centerpieces, cut squares of florist foam (buy at any craft store) to fit in the dishes, soak them in water and place them in the bottom of each one. Push a candle into the center of each piece of foam. Take fresh flowers (I bought two bunches at the grocery store) and snip the stems to 3 - 4 inches long (vary the stem length so you have more flexibility in arranging them). Push the stems into the wet foam, spacing them around and filling in until you have used all your blooms. The fuller it is the prettier it looks. Then, I go out front and snip clippings from my bushes and fill in any holes with greenery. Voila! This seriously takes 15 minutes to put together once you have all the items. 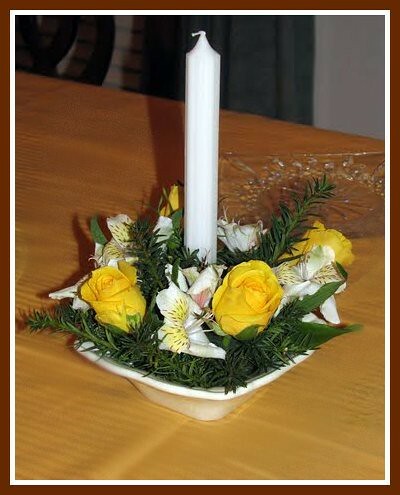 You can easily adjust the size and color of the arrangement by using different containers and different flowers. So who else has a simple holiday decorating tip? If you've done a post about it, link it in the comments! I very nearly expected to read that you had bought a couple of fancy corsages and stuck a candle in the middle! I have a feeling buying the flowers from the supermarket would be quite more cost effective. Very, very pretty - and if I end up having Thanksgiving at my house - I will definitely try it. Pop - Martha would never cheat like that. I would, but I didn't think of it. heh. What time should I arrive for dinner, Martha? Lately I try not to leave the plastic ketchup container on the kitchen table or the tub of butter. It's classier that way! That made me gasp. It's so lovely! Your table looks so pretty. Believe it or not that is the kind of Christmas and Thanksgiving table scape I grew up eating around while wearing a dress. This years I'm trying figure out if we can all stand around the stove with forks since our table is too small for us all to sit at. 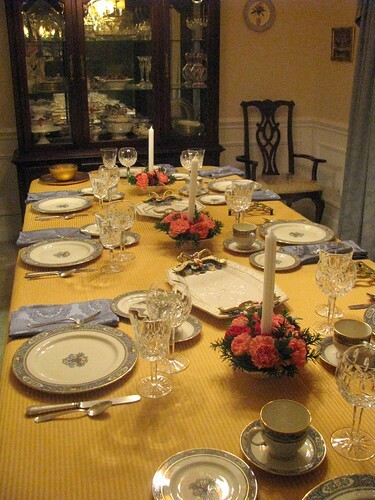 Or we could eat in shifts of groups of four and all have the pretty table experience but not together. ooooh that is so very very pretty! I would love to do that but I fear that The Damn Emos would set fire to the table and Boo would probably eat the flowers. Or the florist foam.